Aaron Rodgers last Thursday threw his 200th TD pass as a Packer when he connected with rookie Davante Adams on a score in the second quarter. Rodgers reached the 200 TD pass mark in his 99th game, the second fastest in league history behind Dan Marino who reached 200 TD passes in 89 games with the Miami Dolphins. Rodgers also joined Brett Favre as the Green Bay QBs who have 200 or more career TD passes (Favre had 442 with the Packers). 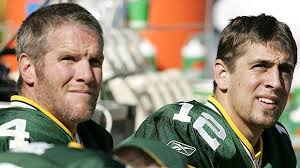 The Packers are now one of five NFL franchises that have two quarterbacks who have 200 or more career passing touchdowns in the team’s history. Here’s a look at those franchises that have two or more QBs with 200-plus TD passes. Trivia answer: Bart Starr (152), Lynn Dickey (133) and Tobin Rote (89) are the other three QBs who have thrown 75 or more TD passes in their career with the Packers.